Thunder Wolves is coming to Steam in a few short hours. 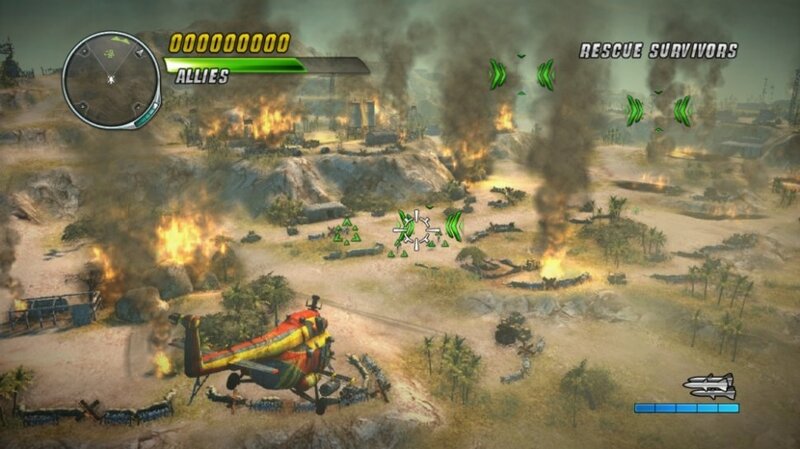 This action/shooter will allow you and a co-op partner to play the roles of pilot and gunner in a variety of helicopters. We have a new gameplay trailer submitted for your approval. I have to say, I'm a little confused as to what sort of tone the developers, Most Wanted Entertainment, are going for. The new trailer makes the game look like an arcadey, almost cartoony, romp. An older video from April gave the title a much more cinematic feel. Then there was the announcement trailer, back when the game was going to be published by Ubisoft, where Thunder Wolves was portrayed as an annoying, bro-y, spectacle. The little character portraits that keep popping up are distracting the hell out of me. The game still looks like it might be a lot of fun. I wonder how the camera will work with the two player local co-op setup... Oh look, we did a hands-on preview earlier this year. Nick covered all the co-op details, including camera and controller options. The gams supports a mouse/keyboard and gamepad or two gamepad setup. Communication will be key, as you and your co-op partner will be sharing a helo and the camera. When it comes to vehicles in games, my local co-op partner has been running while I've been gunning for years. We might have to check this one out. Thunder Wolves supports two player local co-op. Tomorrow it will be available on Steam for $14.99. If you pre-order now you can get it for $11.99. It will launch on the XBLA and PSN at a later date.